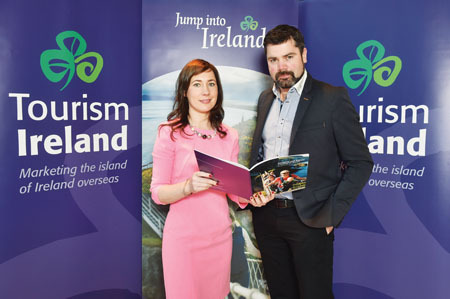 Leonie Kelly, Tourism Ireland, and Gary Gorman, Exploring Vacations (tour operator based in Mullingar), at the launch of Tourism Ireland’s new strategy to boost tourism from Germany and France, in the Radisson blu Royal Hotel in Dublin. Germany and France offer significant potential for Irish tourism, according to a new strategy unveiled by Tourism Ireland. The launch was attended by tourism businesses from around Ireland - including Gary Gorman of Exploring Vacations. Tourism Ireland’s new three-year plan, Germany and France - A Strategy for Growth, sets out challenging and ambitious targets which will see the number of German and French visitors to the island of Ireland grow to 1.1 million by 2016, delivering revenue of €602 million for the economies north and south. 2013 was a record year for visitor numbers to Ireland from Germany and France - our third - and fourth-largest tourist-generating markets. The new strategy - developed in close co-operation with Fáilte Ireland, the Northern Ireland Tourist Board, the Irish Tourism Industry Confederation (ITIC ), as well as commercial industry and travel trade partners, at home and overseas - will build on this success and drive accelerated growth from both markets over the coming three years. German journalists say Westmeath is ‘Wunderbar’!